A Tucson-based non-profit raised $60,000 for veterans charities at their inaugural fundraising event, the Tucson Beefsteak. Empower Coalition Inc. is a group of 30 men who are dedicated to making a noticeable difference in the community by raising money for veterans. On Tuesday, the group presented two checks to two different charities. 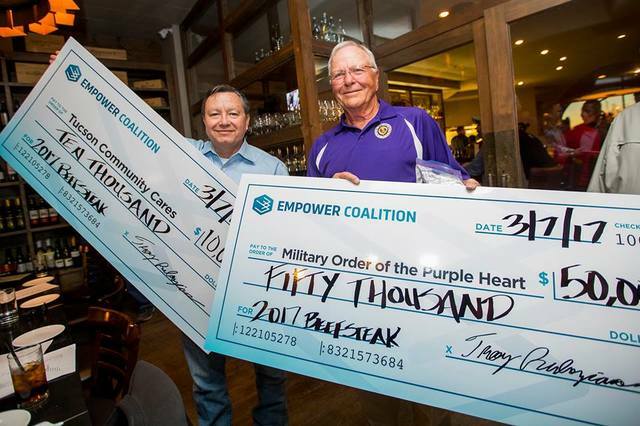 The Military Order of the Purple Heart received $50,000 and Tucson Community Cares received $10,000. The fundraising event, The Tucson Beefsteak, took place on February 18. Guests enjoyed all-you-can-eat beef and other food, complimentary beer, a live auction and live entertainment. The Empower Coalition Inc. was started in 2016 and consists of 30 members with a mission to improve lives in the Tucson area by empowering charitable organizations.